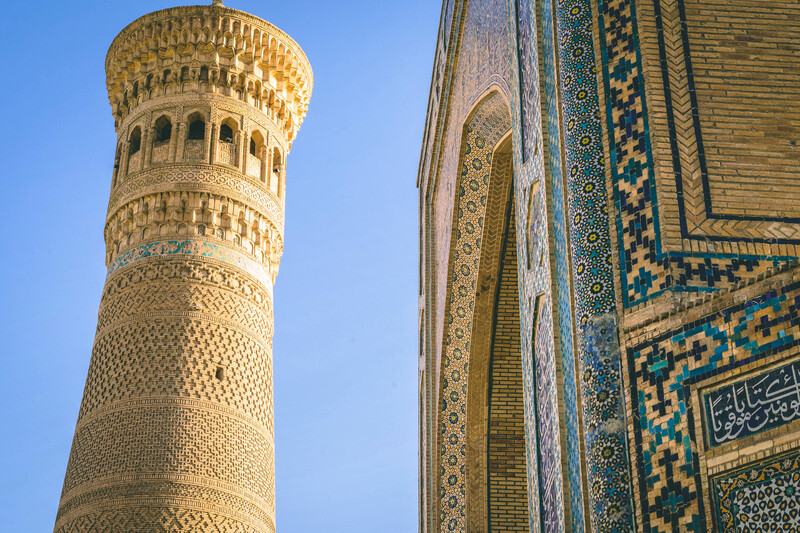 After Samarkand, Bukhara is perhaps Uzbekistan’s most famous city. 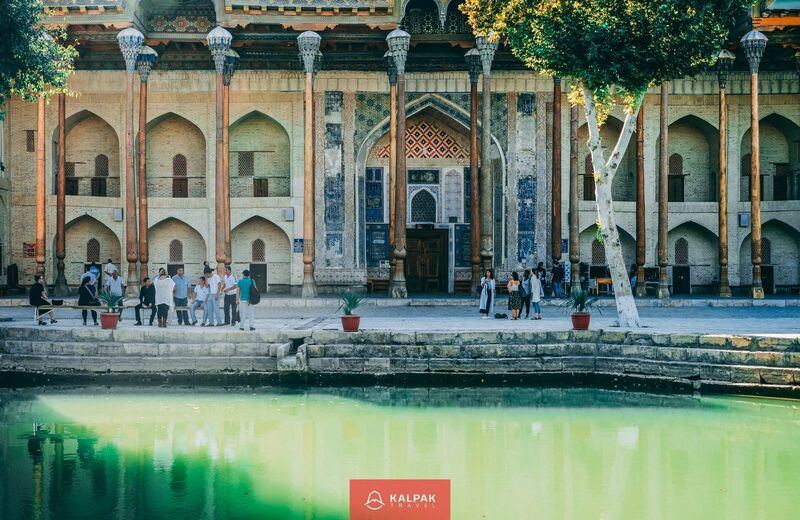 Like Samarkand, it was once a stop on the ancient Silk Road and today is bursting with historic buildings and monuments. 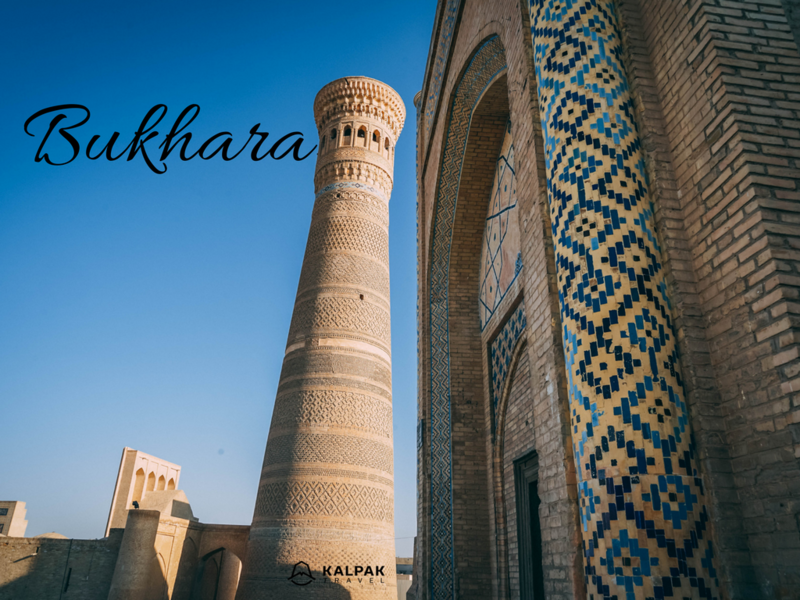 The name Bukhara, written in the Uzbek language as Buxoro, is thought by some to mean monastery, its translation from the Sanskrit and a reflection of its religious significance throughout a long history. The Sogdians called it the “fortunate place” while other names focus on its role as a learning center, particularly for Islamic Studies. 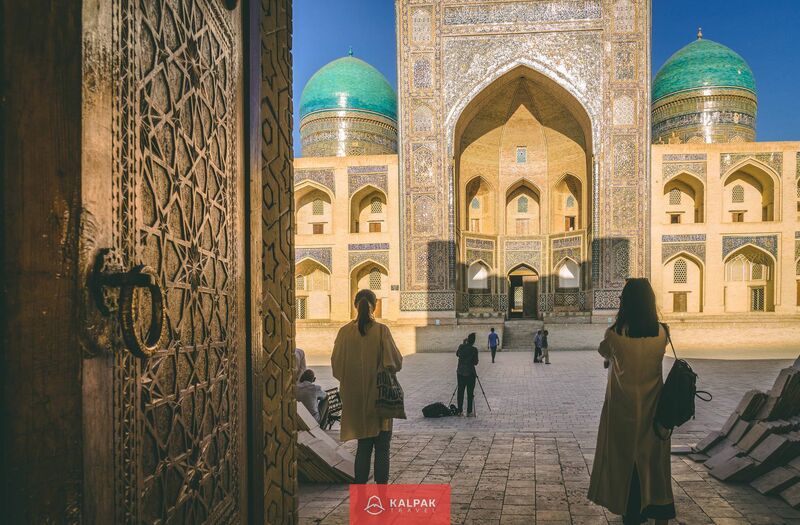 This Bukhara Travel Guide gives you a short overview of the most important hallmarks of this ancient Silk Road city in Central Asia. 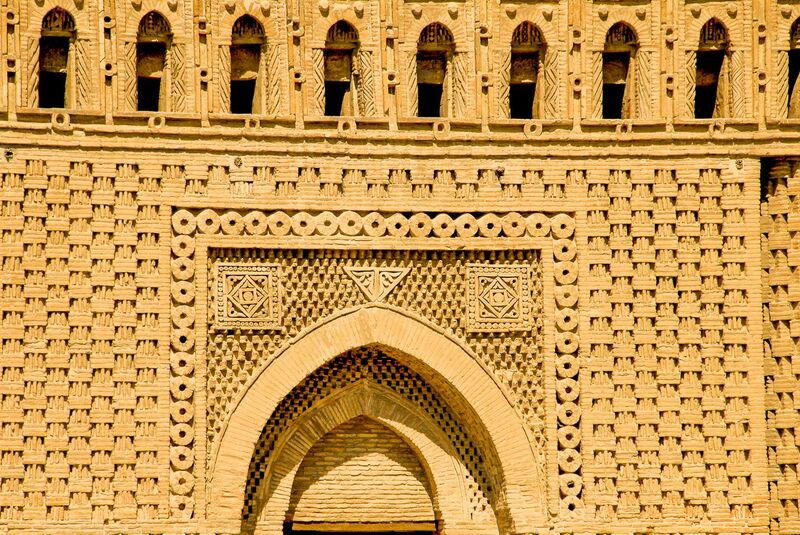 During its turbulent history, Bukhara has been destroyed and rebuilt several times. It was the capital of the Samanid Empire in the 9th and 10th centuries, the capital of the Khanate of Bukhara from the 16th to the 18th century, then of the Emirate of Bukhara and finally the capital of the Bukharian People’s Soviet Republic. In 1925, it became part of the Uzbek SSR under Soviet rule. Despite these destructive changes of power, the city’s rich history is apparent in its medieval architecture, such structures leading to UNESCO recognition. Even on the most fleeting of visits, you cannot fail to be impressed by its historic landmarks. View it as an ensemble piece, for it’s the collective ambiance of Bukhara rather than an individual landmark which makes it so special. Unique in Central Asia in terms of both architecture and cultural value, the Samanid Mausoleum was built in the 10th century. 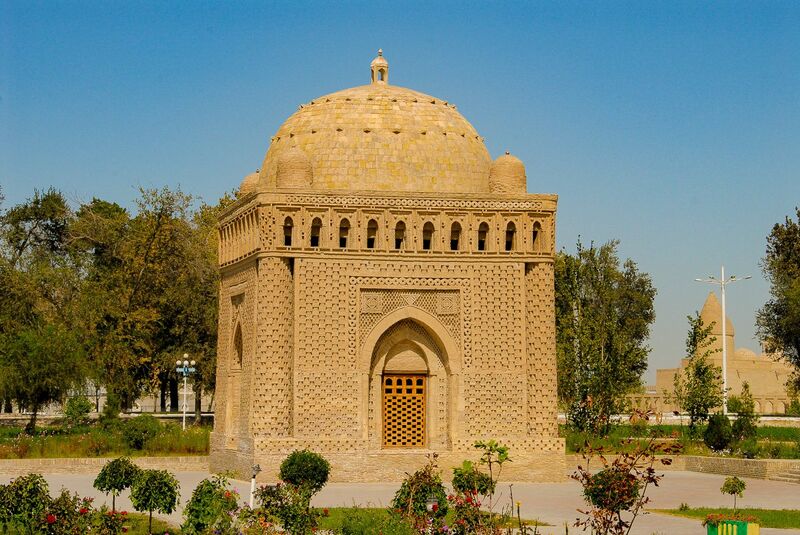 Here you’ll find the tomb of Ismail Somoni, reflecting the emphasis Bukhara devoted to education and the patronage of key figures in the fields of arts and science. The style of the building reminds us of ancient Zoroastrian fire temples, decorated with a blend of local and Islamic decorative brick art. In Zoroastrian and pre-Islamic beliefs, squares symbolized both the earth and life upon it, circles stood for eternity, heavens and celestial bodies and octagons were the manifestation of those two symbols combined. 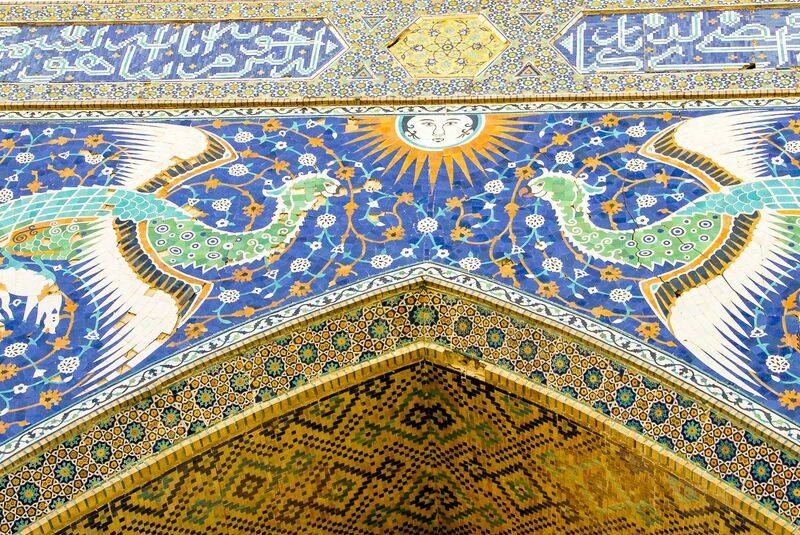 Even the shapes used in the construction and decoration of the Samanid mausoleum reflect this. Such decoration and big mausoleums confronted Islamic teachings at that time. It is assumed that the mausoleum survived because it was already swamped with mud and sand by the 12th century and did not stand out from other graves located nearby. Others believe that this site has long been considered as a sacred site and that locals covered it with sand on purpose in order to protect it. The mausoleum was excavated in a very good condition in the 1930s. Nowadays you will encounter locals and tourists circling the mausoleum three times, as it is believed that those who do so will have their dreams come true. This impressive fortified castle has been a symbol of power for millennia. Ark in this instance means citadel. Archaeologists have only recently discovered evidence that this citadel had been rebuilt numerous times since the 5th century. Each time, the new structure occupied a position on top of the ruins of the previous one, giving it the appearance of being located atop a hill. The gates date from the 18th century; the terrace above would have been used by the Royal family as they watched public events, announcements and even executions in the square below from their lofty vantage point. That square dates from the 12th century when it would have hosted a bazaar. There was also a kind of hospital, where the sick people could come and see a doctor or natural healer. In the Samanid era, there was a large library in the Ark that contained rare books from all over the world and was used by Avicenna. Up until the 20th century, terrible torture and executions took place in front of the Ark. Punishments were harsh. Convicted criminals were beheaded; one notable occasion saw such a punishment meted out to British officers Charles Stoddart and Arthur Conolly in 1842. You can read more about the events leading up to the beheading in Peter Hopkirk’s book, The Great Game. Some people escaped with their head, though their fate was unpleasant, to say the least. Cheats were thrown into a bag filled with wild cats and there was a bug pit with specially bred scorpions used for torture purposes. 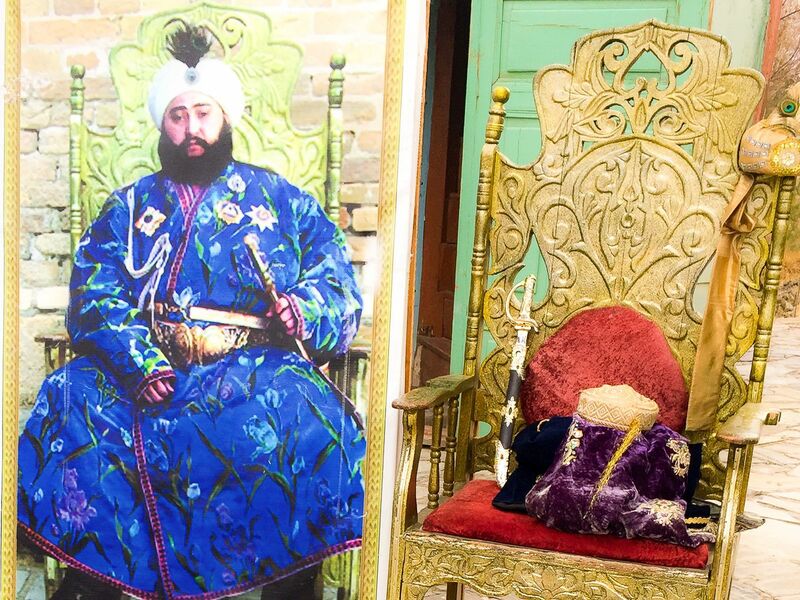 Finally, in 1920, the last Emir (ruler) of Bukhara fled under Bolshevik attack and the Ark was left severely damaged. Right in front of the Ark, there is a mosque with an open veranda standing in front of the Bolo Khauz. Khauz means pond or pool and Bolo Khauz means boy’s pond, and this body of water is much older than the mosque that was built in 1712. The Emir used to cross the square from the Ark to make his way here for Friday prayers. The impressive and ornately decorated summer mosque with a tower was built in 1917, during the era of the last Bukharian Emir. Lining the veranda stand twenty wooden pillars; it’s thought to be lucky if you see a perfect reflection of all twenty pillars in the water as the number forty is sacred. Lyabi Hauz literally means by the pond. This particular pond is just one of the hundreds you would see throughout the city in Middle Ages. Water was scarce here, thanks to Bukhara’s location on the fringes of the Kyzylkum desert. 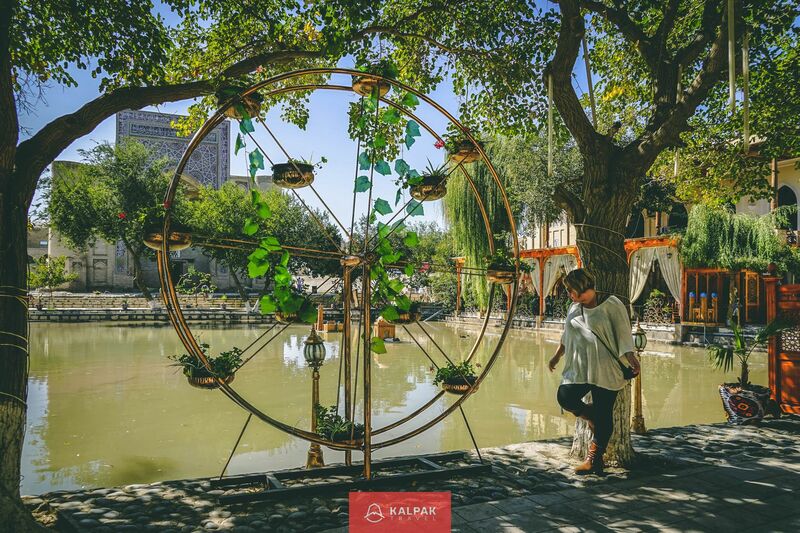 The city was last to receive its water from the Zaravshan River via a network of canals and these were used to top up the ponds twice a month. From these, streets that were too narrow for traffic were supplied by water sellers who carried their cargo by donkey and sold the precious commodity for a handful of coins. The same water was used for washing, drinking, and sanitation; it comes as no surprise to learn these ponds caused the spread of many diseases. In the 20th century, in the name of progress, the ponds were drained, filled and built over. A few remain as ornamental ponds, popular with visitors who sit under the shade of mulberry trees and watch the world go by. Surrounding Lyabi Hauz are three important buildings. The first is the Madrassa Kukaldasch built in 1569, which contains 160 rooms for students attending the religious school. The second building is “chanaka” which means a place for pilgrims. Pilgrims or dervishes could come and stay for free, eat and rest there. It was built and named after Nadir Diwanbegi in the 1620s. The third is a very special building with unusual decoration featuring mythical birds from local legends. 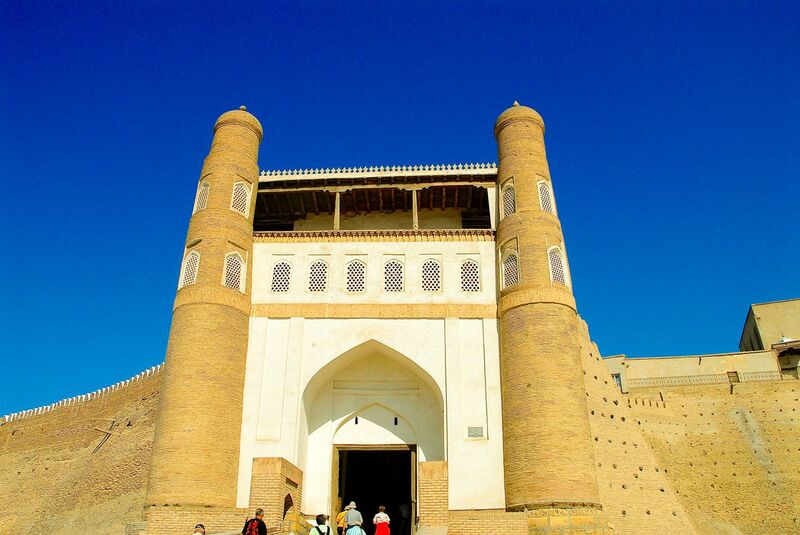 It was built in 1623 and was originally intended as a caravanserai for Silk Road traders. It has been repurposed shortly after its completion as a madrassa and in front of stands a statue of Hodja Nasredin, a half-mythical figure who crops up in local legend. 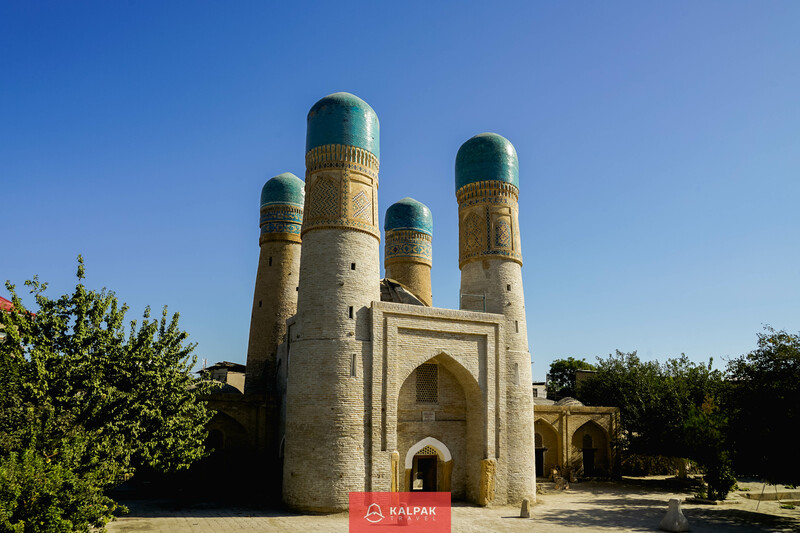 Possibly the most iconic landmark in Bukhara is Poi Kalyan, the highest Kalyan minaret in the country standing 48 meters tall. It was built in 1127 by the Turkic Karakhanid dynasty and decorated with terracotta bricks giving the structure its distinctive stripes. What’s interesting about this minaret is that people dispute whether it was or wasn’t used for the call to prayer. In reality, it probably served multiple purposes: as a beacon helping caravans locate the city, as a watchtower and even a place to incarcerate criminals. The original mosque and madrassa of the Kalyan complex were destroyed by a violent assault by Mongol troops in 1220. 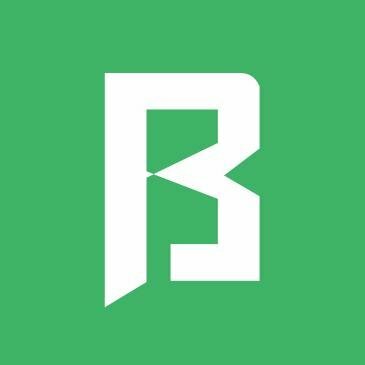 Bukhara held out for fifteen days and was severely punished for such resistance. Legend has it that the Kalyan was saved by Genghis Khan himself. Stomping out of the heavily damaged mosque, he looked up to the top of the tower and his hat fell off. As he bent to pick his hat he remarked that it was the first object in the world that had made him bend as a result of its majesty. 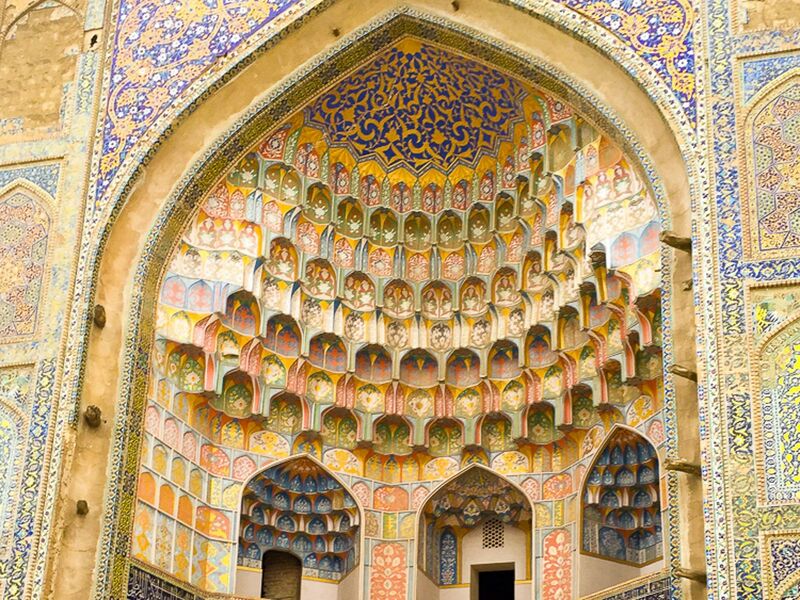 Whether it is true or not, travelers from all over the world are delighted to see this masterpiece today in Bukhara. 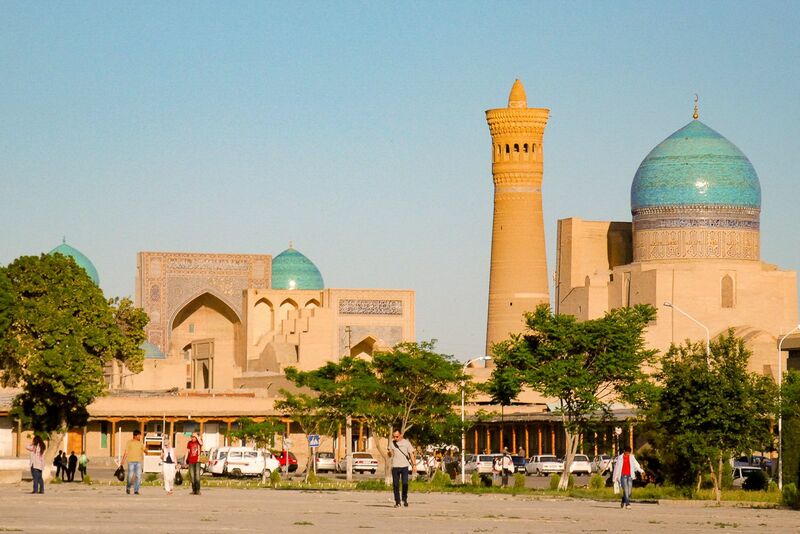 Sightseeing tours of Bukhara usually include visits to several madrassas. In its heyday, the city had over 150 of them. It wouldn’t be uncommon for scholars attending these religious institutions to take fifteen to twenty years to complete their studies. The curriculum included mathematics, poetry, logic, Quran and Islamic legislature. After completing these studies, one would be qualified to become the Imam or head of the mosque. 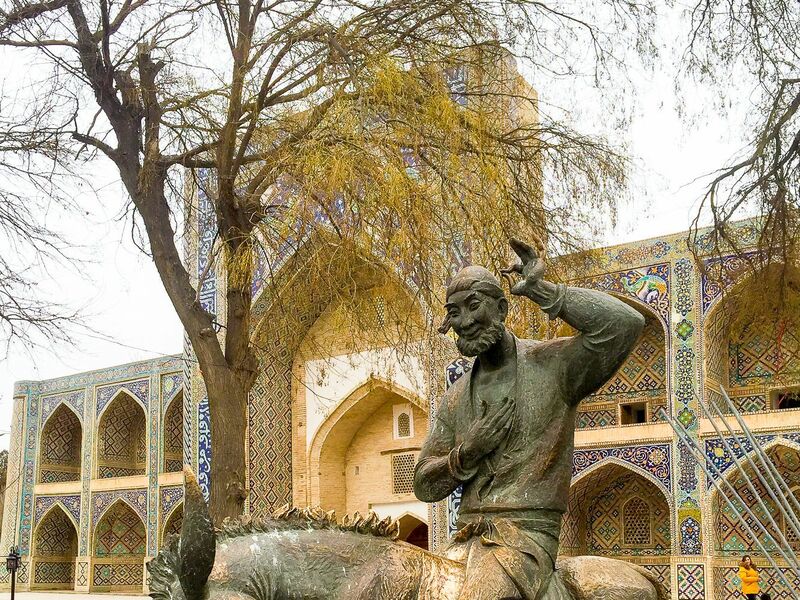 In Bukhara, notable madrassas include Ulughbek Madrassa constructed in 1417, Abdullazizkhan Madrassa built in the 1650s and Khoja Gaukushon, dating from around 1570. The Miri-Arab madrassa forms part of the Poi Kalyan ensemble in the old center of Bukhara and was built in the 1530s. 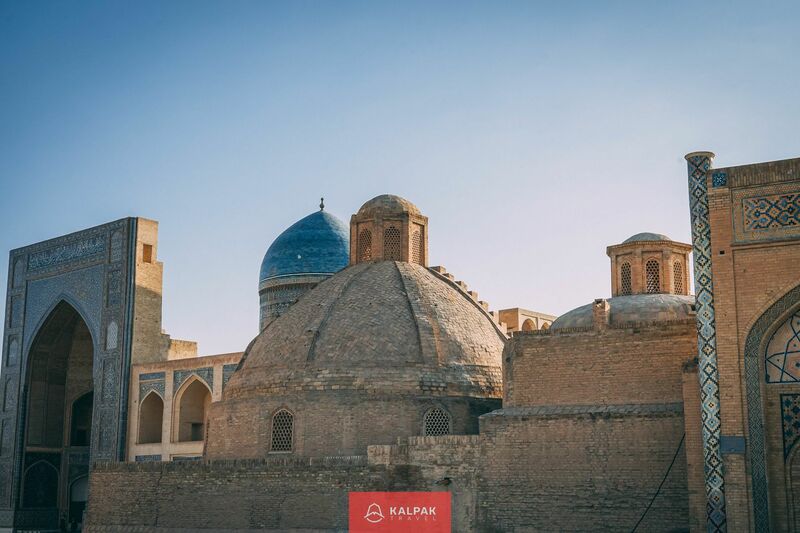 With its two blue domes and ornate decoration, it is also a shrine to the medieval Emir of Bukhara Umaidullah and his spiritual mentor Miri Arab. This was the only Islamic religious school in the whole of the Soviet Union that was allowed to conduct secular studies after the World War II in recognition of the Muslim soldiers’ contribution to victory. It still functions as a madrassa and these days it takes four years of studies to qualify as an Imam. Nowadays there are ten such functioning religious schools in Uzbekistan. The four towers of this building make it unique amongst the architecture of Central Asia. The towers are not designed for the call to prayer, and only one of them is accessible and used for storage. A rich merchant named Niyazkul built it over two centuries ago to form part of a mosque and madrassa complex. Some say that the towers were meant to symbolize the merchant’s four pretty daughters and therefore each tower had to be decorated differently yet equally beautifully. 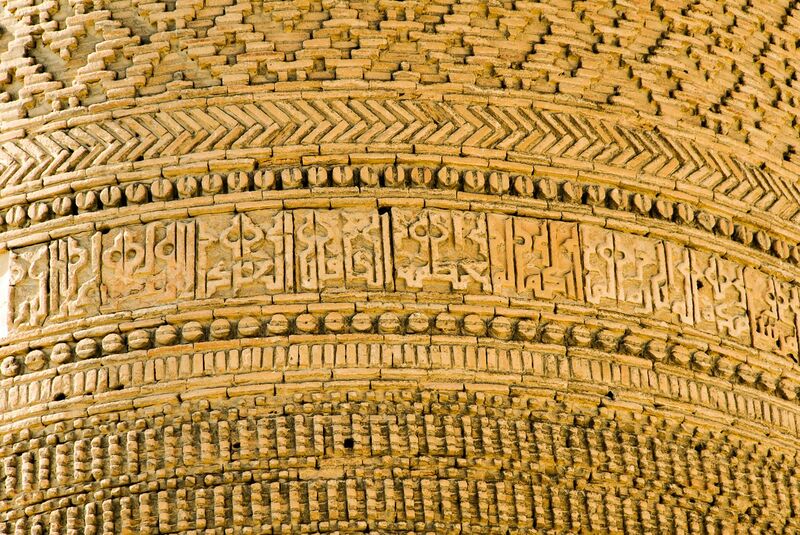 Others see in the decoration a symbol of four religions: Islam, Christianity, Judaism and Buddhism, a nod to the religious diversity that characterizes Bukhara. There is a Bukharian Jewish Quarter, once sizeable and influential. Just outside the city, if you have time, we’d recommend you visit Sitorai Mokhi-Khosa Palace. Its name translates to mean a palace as beautiful as the moon and stars. 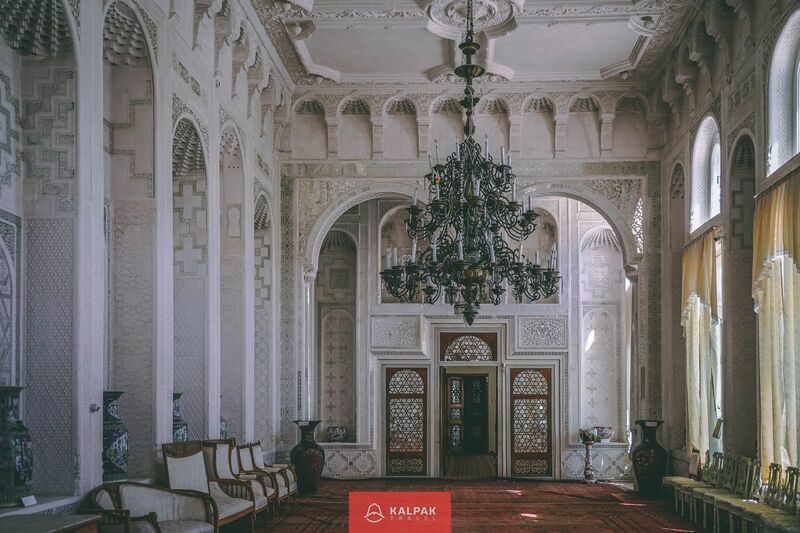 It’s relatively new, built at the start of the 20th century and inspired by Russia’s great imperial palaces – the last Emir of Bukhara studied in St Petersburg and got on well with the Tsar. It was the Emir’s summer residence; he preferred it to the Ark. Inside, marvel at his collection of Chinese porcelain, Venetian glass, Russian and European furniture and lavishly decorated halls with golden ornaments. Moreover, you will see the harem quarters with its pool that could be observed from the Emir’s outside throne. Since 1927 it has been a museum. Indeed Bukhara and its environs is a place where people from different ethnic and religious backgrounds have co-existed peacefully for centuries. Traders traveling from India to Venice would stop in Bukhara as they traversed the ancient Silk Road. 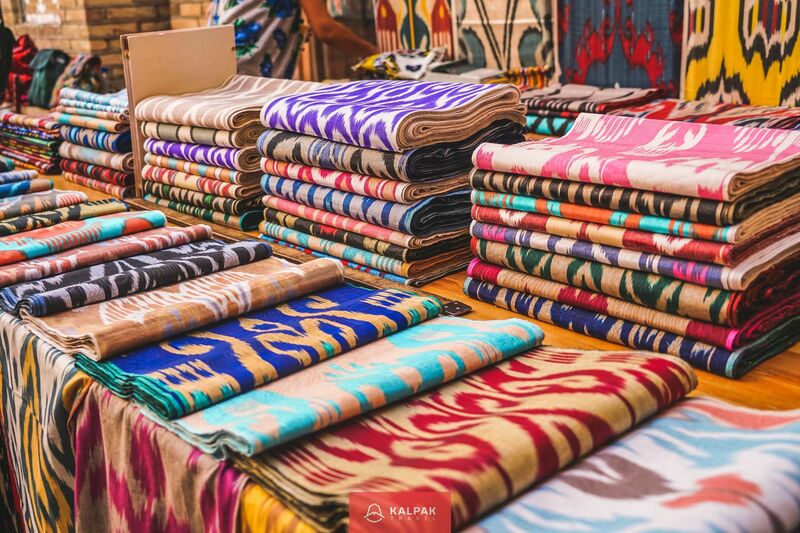 You can still buy silk scarves, Bukharian knives, scissors, exquisite embroidery and local pottery. Special trading domes offered protection from the sun and the wind. 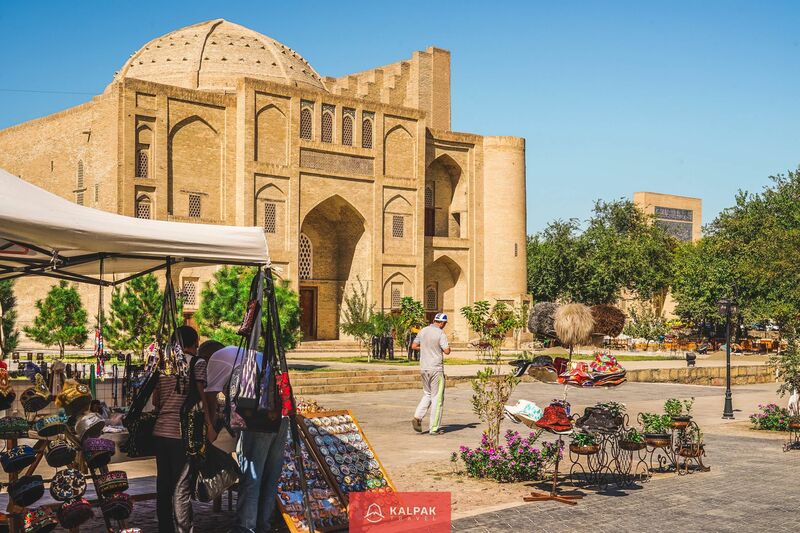 Bargain hard and you’ll feel like a Silk Road trader searching for exotic goods to take with you – or a tourist who’s just found the perfect souvenir to take home from one of our many Uzbek tours. 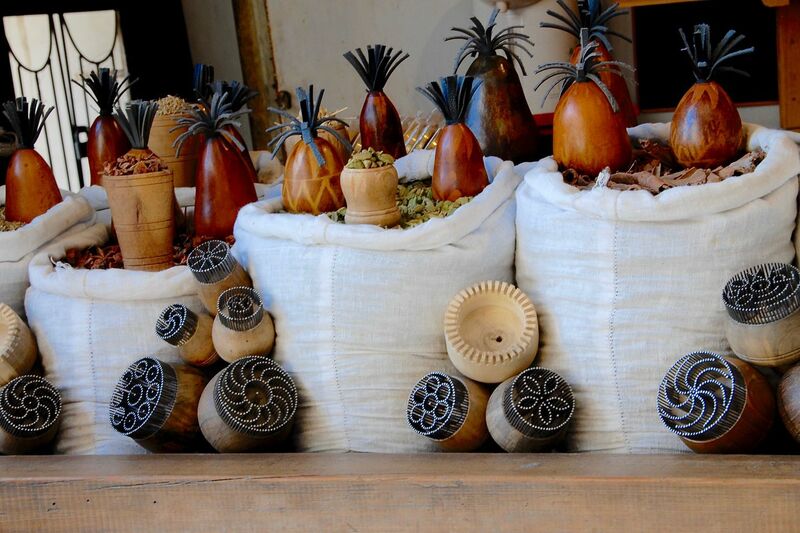 For example, you can get Silk Road spices packed in such dried and decorated pumpkins, or tool to make traditional decorated round bread. 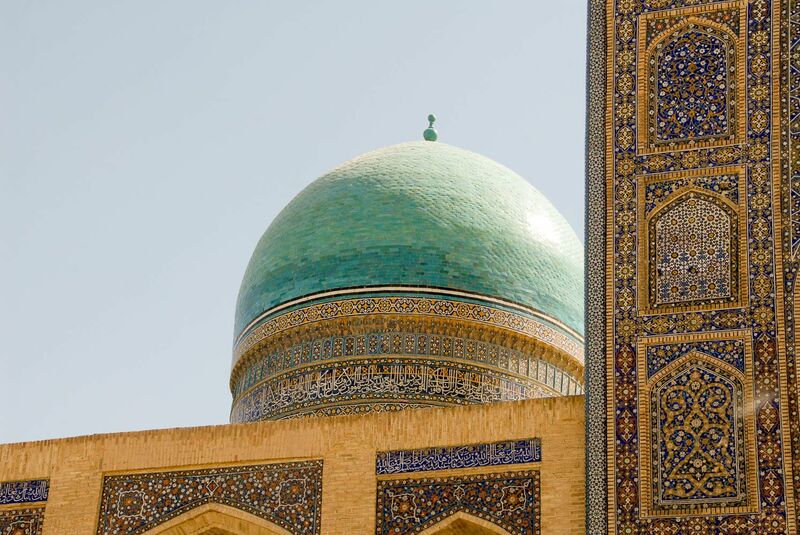 Check out our Uzbekistan Tours or read more about the Silk Road Cities of Uzbekistan.